Design Burd Inc.“New Homes” New Orleans! 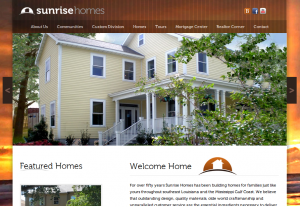 | Design Burd Inc.
Design Burd is excited to launch and host the new Sunrise Homes site. The site features not only the all their new models andÂ communitiesÂ but provides interactive tours, maps for schools, parks and directs and mostÂ importantlyÂ houses available now. The site alsoÂ featuresÂ a quick sale tool displaying houses already in development for those families needing to move soon!! !